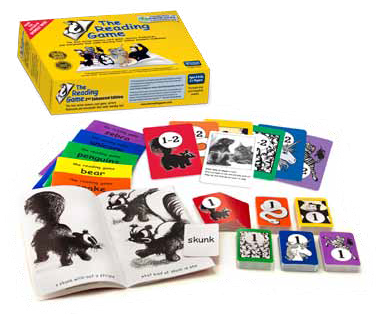 About Kenneth Hodkinson's The Reading Game: Make Learning fast, fun and effective! Over forty years ago, Kenneth Hodkinson, fresh out of college (University of British Columbia, New York University, and Yale University) wrote the first of the Wordly Wise series of vocabulary builders. Constantly revised and updated and now encompassing all grades from K through 12, Wordly Wise today is the gold standard in vocabulary development. Ken is now a grandfather with two granddaughters, Caitlyn and Ashleen. His curiosity was piqued when he noticed that Ashleen, the younger of the two, would pretend to read by holding a book and turning the pages; he also noticed that she required that he point his finger at each word as she was being read to. Ashleen was ready to read. The problem was that Ashleen was not yet in kindergarten. Ken decided not to wait. He developed an early vocabulary builder, a learn to read game he called The Reading Game, which he calls “my second great idea in forty years.” He tested his learn to read program on Ashleen and turned her into an early reader in just over a week. The confidence she gained from being able to read these six books gave her the boost and the motivation she needed to continue to expand her reading skills. You can hear Ashleen read her first book ever after playing the matching card game that accompanies the first book, Skunk, by visiting our How It Works page. Working as a small family business, Ken and his two daughters, Erika and Jessica, have spent the past few years on the testing, development and refinement of The Reading Game. We hope you enjoy playing the game as much as we enjoyed developing it and working with everyone who participated in the field test studies! For international orders please call or email.